The old question, "Which came first, the chicken or the egg?" seems to beg for a modern day revision. It is less important which came first, and far more miraculous and relevant that a chicken and an egg go together, that they are linked. I was seated in a hotel restaurant and ordered a fried egg with toast. When the waitress set my plate down on the wooden table, I was stunned. 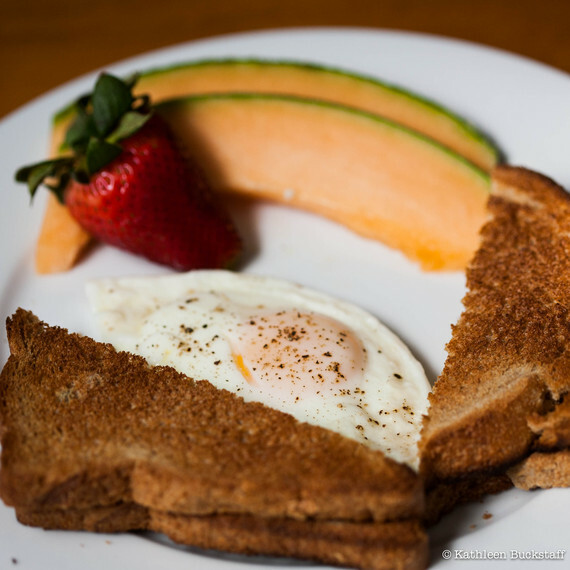 There, in front of me, was exactly what I ordered -- an egg and toast, and yet how I looked at my food was completely altered. 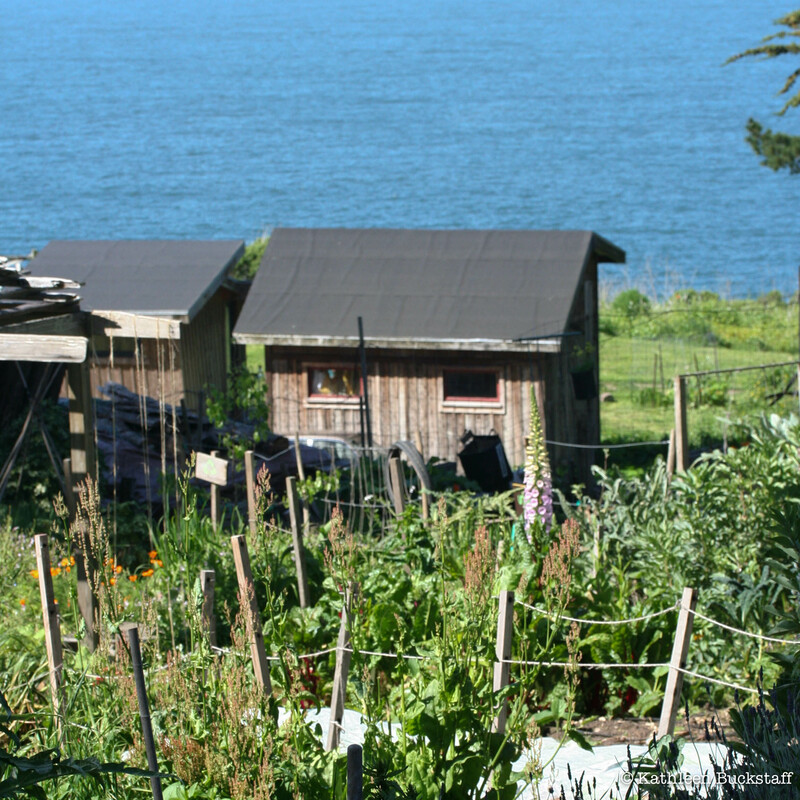 A week earlier, I had been at an organic, educational farm in Northern California called Slide Ranch. I was taking photographs of city kids on a field trip experiencing ranch life -- feeding farm animals, working in a garden, and learning how to milk a goat. When we were inside the chicken coop, our ranch leader lifted a wooden lid that covered nesting boxes, and to our wonderment, we saw... an egg. 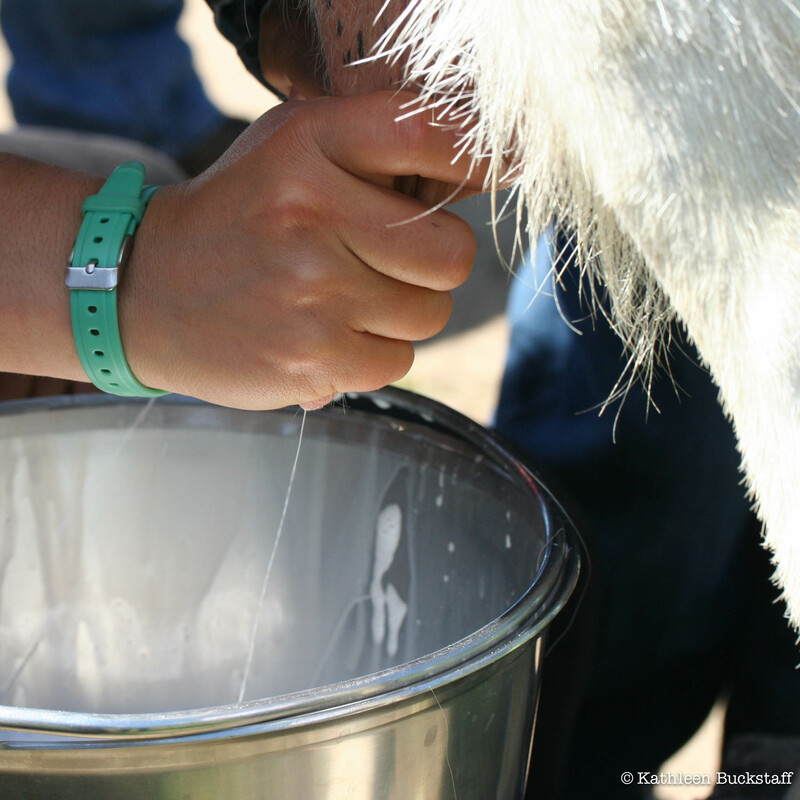 "You can touch the egg, if you'd like," the ranch leader said. 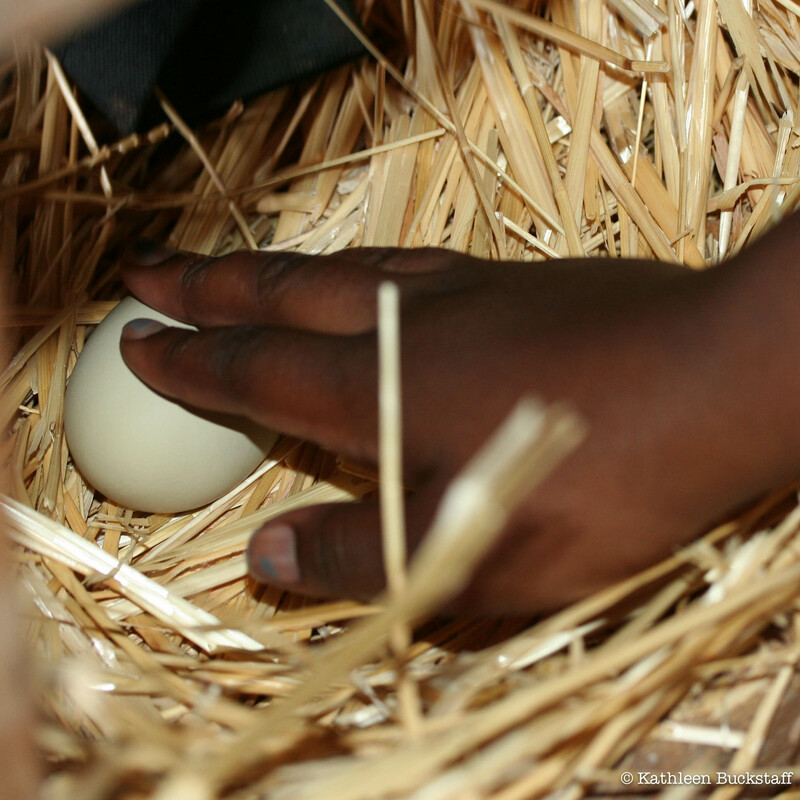 Each child took turns carefully touching the egg that sat miraculously on the bed of straw. "It's an egg," one boy said. The others laughed. "It's really an egg," another said. "It is an egg," the ranch leader said. He told us they had 30 chickens and that they collected about 22 eggs a day. In another nesting box, we saw a chicken. "We won't bother her," the ranch leader said and told us she was laying an egg. Behind a glass window, we saw a dozen chicks huddled together peeping in a corner near a heat lamp. The chicks were noisy, active and looked like yellow balls of fluff. The ranch leader took out a baby chick and we touched the feathers. The chick made peeping sounds and we laughed. "It's so soft," several students cooed. 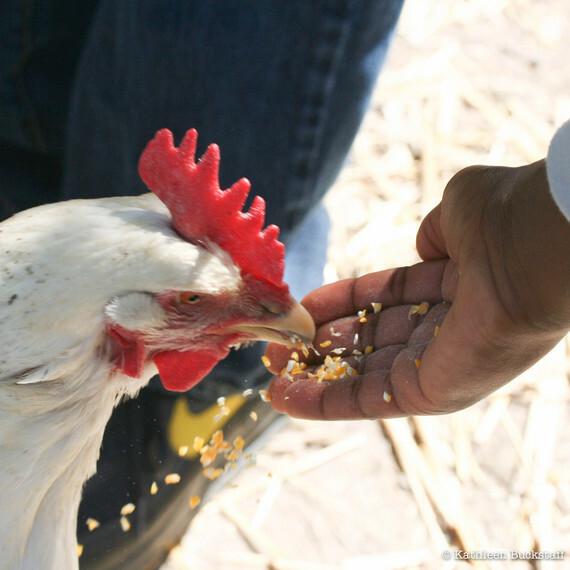 In the chicken yard, the ranch leader gave each child a handful of chicken feed and demonstrated how to kneel close to the ground and offer a flat hand with food to the chickens. "They will peck," he said. "It won't hurt, but it will feel like small pokes on your skin." A few children knelt down and held out chicken feed on flat hands. Chickens pecked at the food, and the children laughed. "It doesn't hurt," one boy told a group of cautious observers. "Here, you try it," he said to me. I was surprised when he spoke to me. I thought as the photographer, I was invisible to the children. The boy poured some of his food ration into my hand, and I was touched by his enthusiasm and generosity. He encouraged me to kneel close to the chickens. I held out my hand, and two chickens approached and then pecked. Many children watched my response. The beaks pricked my skin, and I laughed. "They're pecking, but it doesn't hurt. It's fun," I said. A few more children knelt down and offered their food to the chickens. This is how we made our way around Slide Ranch -- cautious, trying new activities and yet, full of joy and wonder. We all walked through a poop-filled corral. Some touched goats and sheep, while others tiptoed along the fence trying to keep shoes clean. "That's why they told us to wear old shoes," one student called to another who was skirting the perimeter. 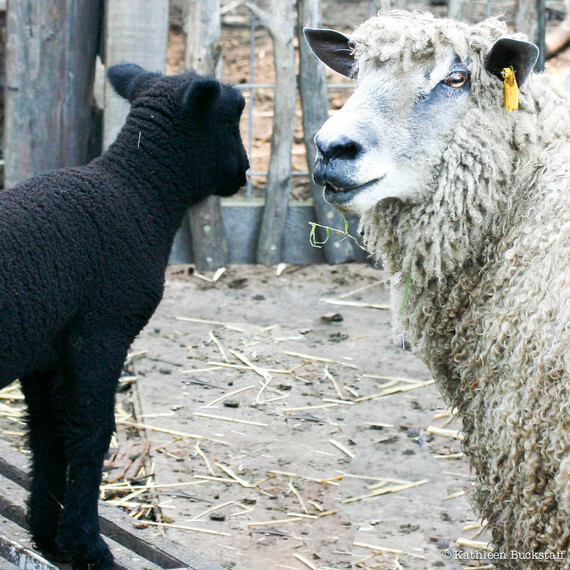 A ranch farmer heard the exchange and said, "Sometimes when I'm in the corral, I say thank you to the goat poop because we use it to fertilize the garden where all the vegetables that we eat grow." I saw several students stop to consider that fact. Later, I saw the extensive vegetable garden and marveled at how wild and crazy an artichoke plant looks. There were employees from a company working in the garden as a corporate retreat. 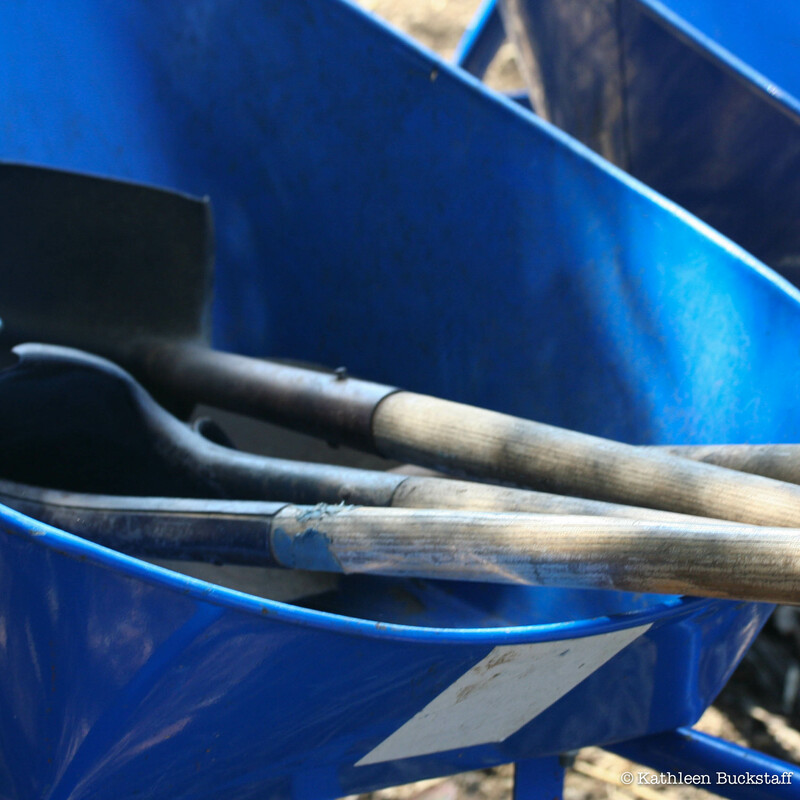 I liked seeing city adults pushing wheelbarrows and rotating the compost heap. They were clearly experiencing a new kind of teamwork. As I drove away from my day at Slide Ranch, I turned and looked back at the dirt road that broke off of Highway 1. There was a sign I had driven past. I pulled the car over and took a picture. The sign itself seemed important. 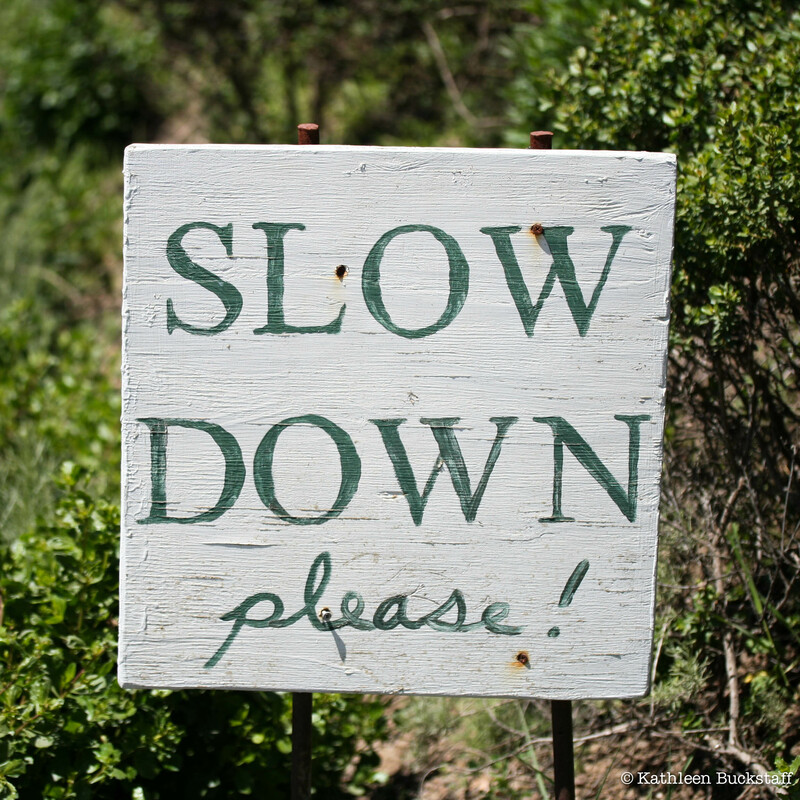 Someone had painted on a wooden board, "Slow Down please!" One week later, there I was with a fried egg and toast on a plate in front of me, and instead of inhaling breakfast and racing into the day, I did what the sign said, I slowed down, and I heard in my mind children's voices full of awe saying, "Cool! It's an egg!" The old question, "Which came first, the chicken or the egg?" seems to beg for a modern day revision. It is less important which came first, and far more miraculous and relevant that a chicken and an egg go together, that they are linked. A chicken comes from an egg and an egg comes from a chicken. With fast food and grocery stores, it's easy to forget that connection. A dozen eggs are so easy to purchase that I often forget that a live creature actually laid each egg. When connecting the two, the miracle of life itself is enough to fill a plate with wonder. I knew as I looked at my fried egg that I was not the only one who was seeing an egg in a new way. I thought of the 100 city kids who had experienced Slide Ranch that day. "Wow, it's an egg," I thought. 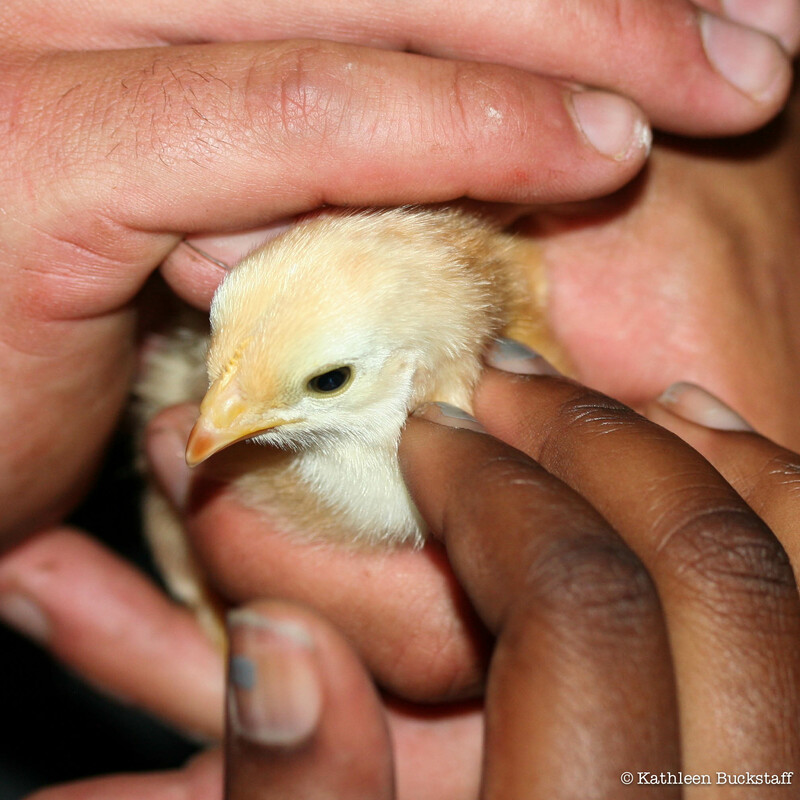 I felt grateful to feel more connected to the chickens, their eggs and the land. Before I began to eat, I said thank you to the chicken who had given me that egg, and I ended my prayer with a quiet, "Amen." Kathleen Buckstaff is the author of two books that celebrate motherhood:Mother Advice To Take With You To College and The Tiffany Box: A Memoir, a USA Best Book Awards Finalist. The Tiffany Box is full of love, humor, heartache, and insight. A gathering of e-mails and letters to her closest friends comprise Kathleen Buckstaff's candid, funny, and recognizably true chronicle of a generation "in-between": nurturing its young while nursing its aged, and coming to terms with the bitter realities that temper life's sweet rewards. A wonderful motherhood memoir.